I’m dating myself here, but I grew up during a time when women/girls rubbed baby oil all over their bodies and laid out in the sun all day long. I don’t even remember hearing about sunscreen until I was in my twenties. My mom never put sunscreen on me when I was a child, and we lived on the beach for two years when I was 3-4 years old. I grew up, like many women my age, thinking you looked healthier if you had a tan. That mentality went on through my teens when I used to lay in tanning beds often, too. It’s what every teenage girl did, especially before a big event like the prom. I know better, now. And I do better, now. Unlike me, my son knows that if you are in the sun… you wear sunscreen. It’s that plain and simple. We know of a couple of people who have had skin cancer and I’ve told my son (over and over, and over) that it’s the sunburns he gets now as a child that will increase his chances of skin caner when he’s older. A little bit of a scare tactic? Maybe… but if it will drive the point home, then it’s worth it. This summer though, is the first time that he really gets it. He no longer complains about it. He in fact, asks for it and/or applies it himself (to the areas he can reach). We spend at least 3-days a week at the pool — sunscreen is crucial. I’ve always been a big fan of Neutrogena products, but sun products that were awarded NEA Seal of Acceptance like Neutorgena’s sunscreens… makes it a product I trust (The National Eczema Association recently awarded its Seal of Acceptance to the five Neutrogena Sun products mentioned above). The Neutrogena Pure & Free Liquid Sunscreen Broad Spectrum SPF 50 is my absolute favorite to use on my face. I love that it is oil-free and won’t clog my pores, but I especially love that it has zinc oxide in it (really protects your skin from the harmful sun’s rays), but blends well so that you don’t get left with that ghostly white look on your face. I’ve been using the Neutrogena Pure & Free Baby Sunscreen Stick Broad Spectrum SPF 60 on my son’s face, ears, and back of his neck. A stick is just so much easier to apply sunscreen with on kids and if it’s safe enough for babies, then it’s perfect for older kids, too. 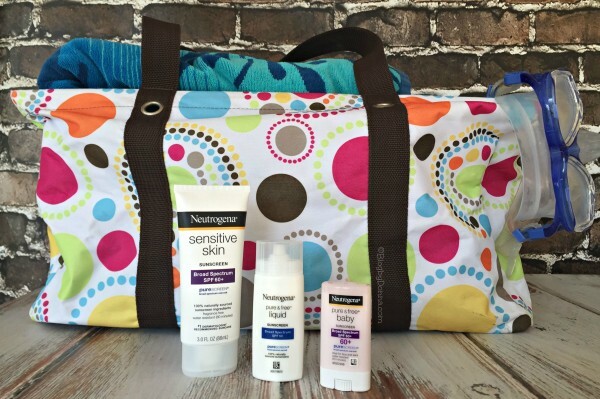 I apply Neutrogena Sensitive Skin Sunscreen Lotion Broad Spectrum SPF 60+ to my son’s and to my areas of the body not protected by clothing since we both have sensitive skin. I suffer from contact dermatitis and have had suntan and sunscreen lotions break me out before. This sunscreen lotion is gentle enough for your skin while providing protection from the sun. Which brings me to another great thing about Neutrogena Sun products, is that it is gentle enough for people with sensitive skin. It’s recommended for people with eczema, in fact. People with sensitive skin need to be extra vigilant with protecting their skin from the sun’s damaging rays. I read that one in five Americans will develop skin cancer, yet only about 20% use SPF daily. Even though I may not have protected my skin in the past, today I choose skin health. I choose to protect my son from getting skin cancer one day. I choose Neutrogena Sun Care products. You can purchase Neutrogena sun care products at Walmart (in-store or online). Here’s to a safe & sun-protected summer! I haven’t tried their sunscreen but I do use their hand lotion and how it helps my hands. I grew up as you did and never wore sunscreen nor did my friends because we didn’t know better. I would also lay out and in tanning beds. When I was 27 I had melanoma for the first time and was in shock and disbelief because I loved being tan. When I was 32/33 I had melanoma for the second time. In fact I saw the place and the dermatologist reluctantly removed it but said he didn’t think it was anything. A couple of days later he called and told me I had been right when I told him it was melanoma I was positive. All of the Dr’s said it was from my teenage years as you said. To date I haven’t had it again but I was blessed in that it was spotted early and removed. I am adding Neutrogena sunscreen to my shopping list to pick up the next time I’m out. Thanks for the review. Christy, I’m so glad that your Melanoma was caught early and that you are okay! The thing I really love about the new Neutrogena sunscreen is that it has zinc oxide in it. I think it’s the best ingredient to prevent damage from the sun’s harmful rays and it’s a safe ingredient, too! I need to test this brand out. I have not found a proper cream for my sensitive skin yet. I guess we grew up in the same era! I remember buying Hawaiian Tropic Oil, and within about 1-2 hours, I was burnt as a crisp! But, even though I complained about being burnt…I knew that it would turn into a great tan! Nowadays, I stay in the shade! I don’t like being out in the sun, because getting burnt isn’t fun anymore!!! I know. I never thought twice about sunburns… just kept getting out in the sun so it would turn into a tan. Exactly! The better the burn…the better the tan! So what if you can’t sleep at night due to unbearable pain! Now, all I look for is the shade! I don’t even know, when I turned!! Although, I still seem to get sun somehow?! Thanks for this great review! As I skin cancer survivor, I’m always looking for more products to try! 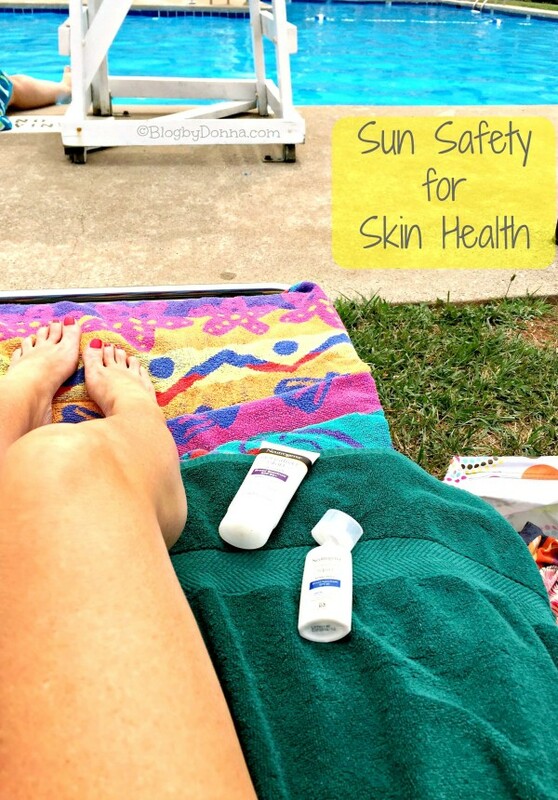 It’s so important to keep our skin protected, especially during the hot summer months. I choose skin health for myself and for my family. I’ve used Neutrogena for years but have never thought to try their sunscreen! I need to test it out this summer! I bake in the sun all summer long, but I always make sure my kids skin is super protected. Neutrogena is a brand I trust. I have super sensitive skin and I live in a really sunny area. I definitely need to pick up some of the 60 spf Neutrogena. I too used baby oil, but added a few drops of iodine to it as that was supposed to add to your tan. I was adopted and was a white blonde child with blue eyes. Everyone else in my family had black hair, olive complexion and dark eyes and they didn’t burn. Every Easter and every summer, my family went to the beach and we stayed out on the beach all day. I burned and peeled every single time and have sun damaged skin with those horrid brown spots. I rarely get outside, but when I do, I wear sunscreen. My son always wears it. 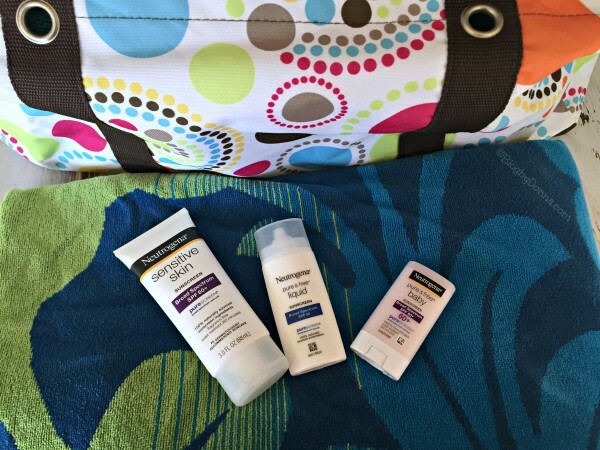 I have always loved Neutrogena sun care products. It’s so very important to wear sun screen with contact of any sunlight. It’s amazing what this can do to your skin. Great post, Donna!